Five years ago Gerry Garvin, 35, got fed up with working as an anonymous cook at top-tier eateries like the Beverly Hills Four Seasons and decided to open his own place. 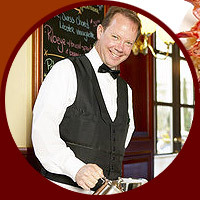 Today his G. Garvin's restaurant offers some of L.A.'s most delectable dining. Suede banquettes and warm lighting welcome the city's Black Hollywood elite (Orlando Jones, Gabrielle Union, Nia Long) as well as ladies who lunch. Though decor and celebrity presence are important in H-town, the real draw is the food: elegantly presented salmon tartare, veal chops in mushroom sauce, to-die-for Chilean sea bass, which Garvin personally prepares. "G. Garvin's will never be a place you go because it's in," says Garvin. "It's about the food." COPYRIGHT 2002 Essence Communications, Inc.